Is the Lowest Price Really the Best Price in Professional Roof Repair? “You get what you pay for.” We’ve all heard the saying that implies that if you pay more, you’ll get better quality and more bang for your buck. In some situations, this doesn’t always ring true, but in the case of professional roof repair, it just might. It’s important to recognize the fine line between when a company is taking you for a hypothetical ride down rip off avenue and a price that is just too good to be true. A fact of life to which many can attest is that if it sounds too good to be true, it probably is. 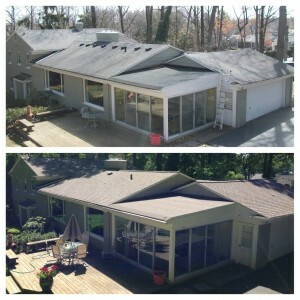 So you’ve found a company and they’ve offered an unbelievable quote on their professional roofing repair services. There are a few things that you’ll want to check into before signing on the dotted line. Of course, price should be one factor of your decision-making process when searching for the right roofing repair company for you, but there could be many reasons for those unbelievably low bids. Your roof repair or replacement is an investment, and that’s for good reason. It’s literally over your head whenever you’re in your house. It is the main barrier between you and the great outdoors above. It makes sense that quality maintenance would be a top priority. How experienced is the contractor? Contractors with little experience may provide bids without considering the possibility of unexpected costs later on. An inexperienced contractor may also be unaware of how to accurately quote a professional roof repair job. Are the roofing materials of high quality? If the roofing repair company is skimping on the types of materials the contractors are using, the price is bound to be lower. When it comes to construction materials, you really do tend to get what you pay for. It’s wise to ask about the manufacturer, as well as the available warranties and reviews. the price. Unless you’re able to find another roofing company quickly, as the homeowner, you’re left with very few choices at that point. When it comes down to it, it’s important to identify a range of average prices. If your professional roof repair quote is more than 15% lower than the others you’re finding, that should raise a few red flags. At that point, you should be asking the roof repair company about all labor and material details, as well as making sure the contractor is licensed and insured. With Bloomfield Construction, you don’t have to worry about low-quality materials or inexperienced contractors. If you’re looking for an experienced and insured company to repair or replace your roof, give us a call at 248-333-3987.